Times below are British Summer Time – apologies to our many readers around the world. Emmanuel Macron, the neoliberal centrist candidate, has beaten the fascist Front National leader Marine Le Pen by 66.1% to 33.9%. But for the fascists, who were not expecting to win this time, this result is huge. The 33.9% of the vote taken by Le Pen is the highest gained by a fascist in Europe since the Second World War. In real numbers, Le Pen took 10.6 million votes – almost double her father Jean-Marie Le Pen’s total of 5.5 million in the 2002 presidential elections, the only other time the FN has made it to the second round. That is an enormous number of votes for a fascist candidate – and a very dangerous level of support. The threat is not just in France but across Europe where the FN’s success is a beacon for fascist and far right parties everywhere. 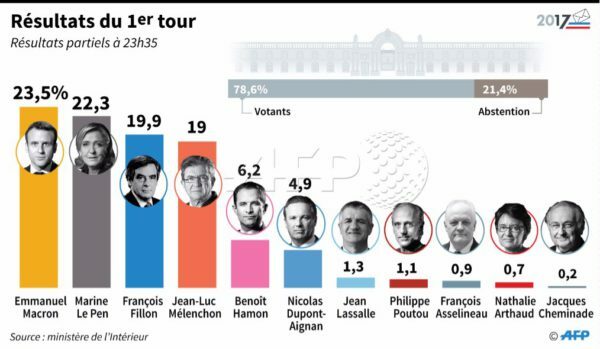 Before these elections, the FN’s previous highest total was 6.8 million votes – and it is notable that Le Pen was able to increase her vote strongly in the second round this time, building substantially on the 7.7 million votes she gained in the first round. With this campaign, Le Pen has succeeded in normalising her fascist politics, establishing the FN as a real and credible contender. In the wake of the vote, she claimed the FN was now “the opposition party” in France. Le Pen and the FN aim to build on their gains in the French parliamentary elections in June. And they will look to consolidate their fascist organisation, which has now shown it can reach dangerously far into sections of the working class, in the months and years ahead. There is more analysis and comment in our full first-round liveblog below. This is a record number of votes for the fascists, whose previous high was 6.8 million. 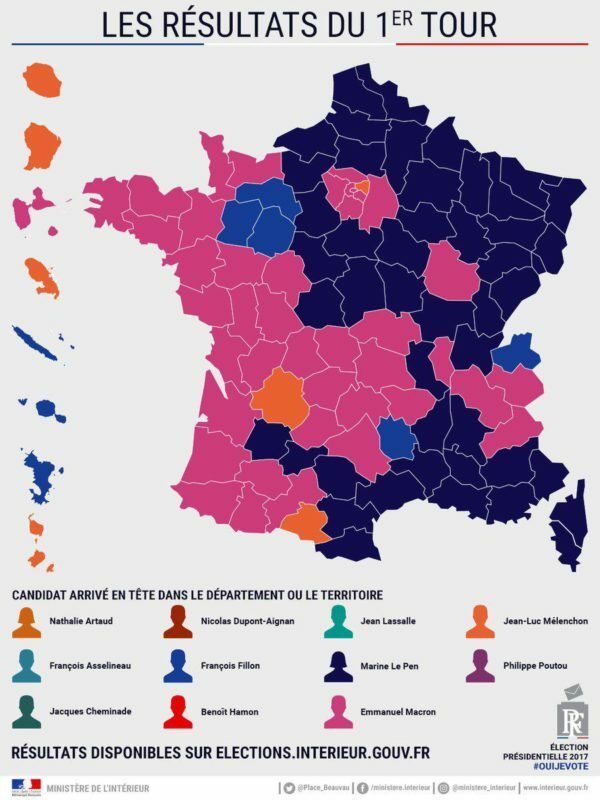 The map below shows the breakdown by region of the first round of the French presidential elections. The next two graphs compare the constituencies where the PS and Republican (UPM) won in the 2012 and 2017 first round presidential elections. They demonstrate the collapse of the France’s centre right and centre left parties. 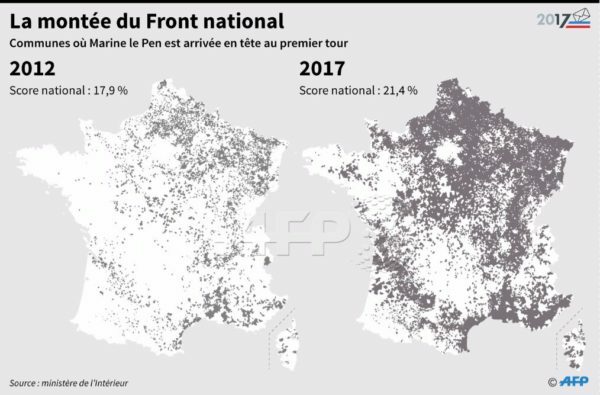 Finally we have published a map showing the constituencies the fascist Front National won in the 2012 and 2017 first round presidential elections. 1.10am We’re wrapping up our live blog for tonight. We will be back later on Monday with some analysis of key local battlegrounds, and more. Thanks for reading. We are still waiting for the full final results, but it is clear that the cetrist Emannuel Macron will face off against the fascist FN’s Marine Le Pen in the second round of these elections on 7 May. Macron is expected to beat Le Pen to capture the presidency in the second round, as voters from other parties lend him their votes to stop Le Pen. But these elections are a huge step forward for the fascist FN. Le Pen herself was not expecting to win this time around. Instead she will have succeeded in consolidating the FN’s position as a key player in French politics, capable of putting together a credible presidential challenge. She is set to take a record number of votes – possibly more than 8 million – in this first round, and will gain even more in the second, when she is expected to get a percentage score in the 30s or even 40s. That is a fascist party seriously implanting itself among wide layers of the population. France has its parliamentary elections in June – and now the FN will be much better placed to stage a renewed assault on MPs’ seats, despite the difficulties of the electoral system. The fascist party poses a real threat in France – these elections are good news for them, even with Macron expected to win in a fortnight’s time. The need to counter the fascist threat in France is urgent. That means not just battling back against Macron-economics, austerity and unemployment in the months and years ahead. It means actually tackling the FN too. It must surely be clear now that ignoring the FN does not make it go away. Over the past five years, it has surged forwards. Even more than before, there is an urgent need for a mass, antifascist campaign clearly targeting the FN. Recent demonstrations against the fascists in some towns and cities are welcome, but much bigger numbers need to be drawn into antifascist campaigning. As we described below, Le Pen held a 10,000-strong rally in Marseille this week. These are dangerous numbers. And we need to look the facts in the face: we are seeing huge electoral advances by the FN here. These gains need to be pushed back by a mass campaign on the doorsteps, to expose the party as a fascist organisation and urge its voters away. The FN is Europe’s most successful fascist party – it is a beacon for fascists and the far right across Europe and in the US. The need for a real mass campaign to begin to drive it back is desperate. The latest figures show Mélenchon edging even closer to Fillon – it is not yet clear whether the leftwinger can catch up and push Fillon, the hard right candidate of the mainstream conservative party, Les Républicains, into fourth place. What is clear is that if the Parti Socialiste, who could see their vote crumbling in the pre-election polls in the past few weeks, had thrown their weight behind Mélenchon – along with the smaller leftwing parties whose combined vote is just under 2% – the results might have looked very different tonight. A united left final campaign bringing together working class PS voters with those of Mélenchon and the radical left parties could have seen Mélenchon cruising through to the second round at the head of the polls, with Macron as his opponent – and Le Pen out of the race in third. 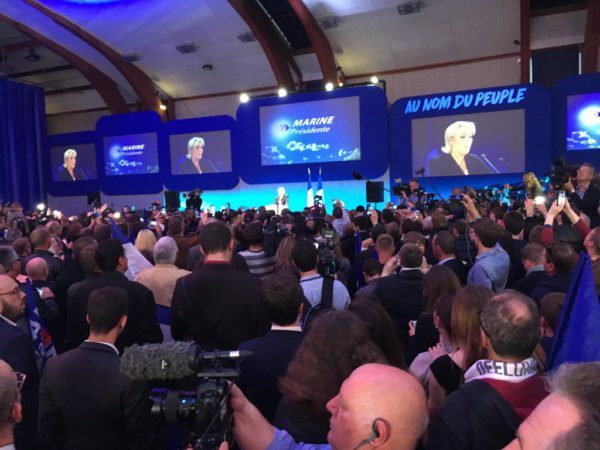 11.50pm – a bit more on Le Pen’s victory rally in Hénin-Beaumont tonight, and her racism. This is a town with a population of 27,000 and an unemployment rate of 20% -twice the national average. Like her rally in Paris, five days ago, there were two key themes to her speech. The first was to blame the political elites for the economic and social problems of the region. The second theme was to blame migrants for the country’s problems. She said her first measure as president would be to restore France’s borders. “It will be done the day after I take power.” According to one journalist present at the rally the crowd responded with chants of “France for the French”. She also vowed to hold a referendum on limiting immigration. Sections of the media have accepted Le Pen’s claims that she has dropped the racism of her father and the “old” Front National – they have helped to normalise the fascist FN in this election. Muslims have been a particular target, with Le Pen saying in France “we would not make women hide behind the Muslim veil”, and claiming outrageously that the “burkini” swimsuit was not a religious garment but “an Islamist provocation”. Here’s a graphic showing the latest – but still incomplete – official voting figures. 11.30pm A note on Mélenchon – his surge has come only in the last few weeks and offers a note of hope on a grim night. For leftwing Labour leader Jeremy Corbyn in Britain – who faces a daily onslaught from the establishment, the media and the right wing of his own party as Labour trails in polls ahead of Britain’s general election – Mélenchon’s results show what can be achieved. Mélenchon voters could also be the bedrock of a desperately needed mass antifascist campaign in France – if he or anyone else will take the initiative of organising it. We now have some official figures, with the count well progressed. In line with the exit polls, they show fascist Le Pen narrowly behind the centrist Macron. The conservative Fillon and leftwinger Mélenchon are also incredibly close in thirds and fourth position. As it stands, Le Pen has already taken more than 7.1 million votes. That figure will probably be well over 8 million by the time the votes are all counted. 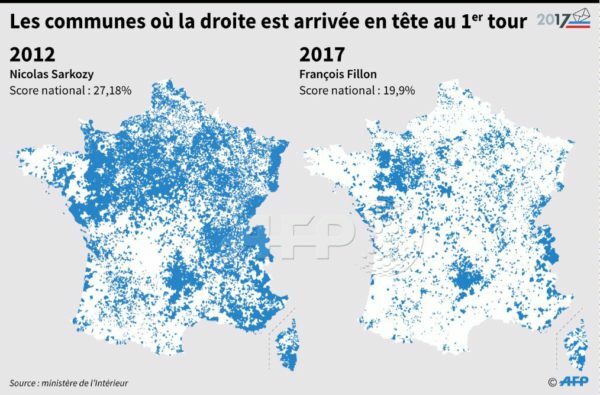 This beats the FN’s previous record of 6.8 million votes in the second round of elections to France’s regional government in 2015. We need to understand how dangerous this is, especially as the numbers prepared to vote for the slick fascist are likely to go even higher in the second round of voting on 7 May. On Facebook, leftwinger Mélenchon – who according to the exit polls is slightly behind the front runners – says he doesn’t accept the projected results arguing that they are only based on exit polls by opinion pollsters. He is urging his supporters to wait for the official results – and for pundits to treat the exit polls with caution. 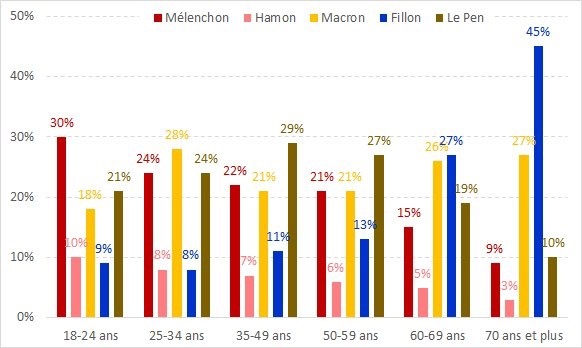 9.20pm Pollsters Ipsos have just published a breakdown of the age profile of those who voted in the first round of the French Presidential elections. It shows two interesting facts. Firstly Le Pen’s vote is weighted towards the younger end – working-age people between 18 and 59. But interestingly Mélenchon has scored far better than Le Pen among the youngest voters. He is attracting young people who are disaffected by the tradional elites and mainstream politicians, the same constituency that Le Pen is trying to win over. 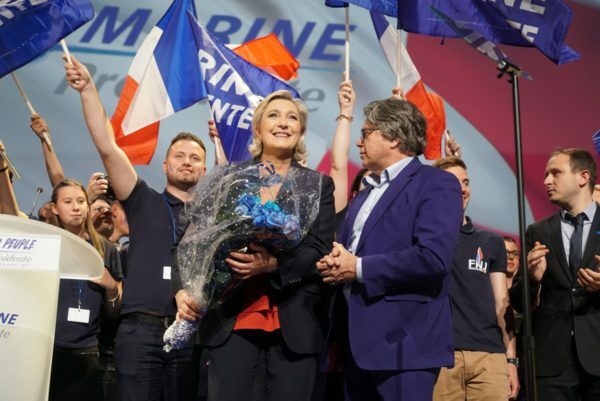 She is celebrating because although she looks set to go into the run-off in second place, her vote is substantially higher than the 17% her father Jean-Marie Le Pen took in 2002 – and unlike him she is likely to pile on more votes in the second round. This election has proved the viability of the fascist party as a serious contender. All of Europe should be worrying now. Last week, Le Pen held a massive 10,000 strong rally in Marseille, one of the FN’s old strongholds from the 1980s. Jean-Luc Mélenchon’s election rallies have far surpassed this, but the fact that so many people turn out for a fascist’s rally cannot be ignored. 8.40pm There are various exit polls out now but they all show the centrist Macron in first place and fascist Le Pen in second. Already Fillon, the conservative, has called for his supporters to back Macron in the second round to stop Le Pen. 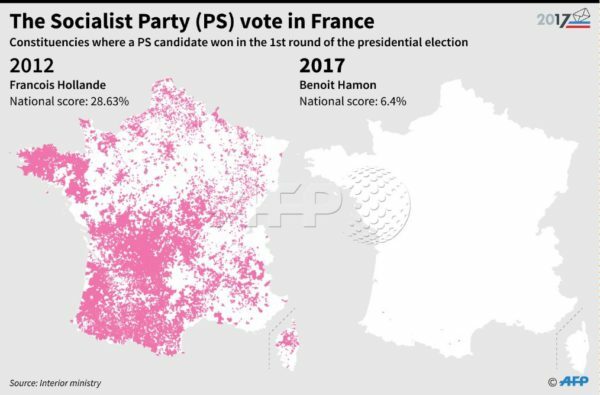 Just to put this in perspective, the Parti Socialist’s François Hollande was in power before this election. Look how far they have fallen as voters abandon the party that pushed through austerity measures. They look nearly dead. Since 1 February the Guardian has published a number of polls Ifop/Fiducial polls asking French people how they would vote in a presidential run off between Macron and the fascist Le Pen. 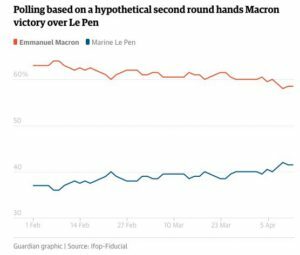 Macron is ahead, but nobody should be complacent Le Pen’s vote is rising and the very idea that a fascist presidential candidate could score over 40% of the vote is spine-chilling. 7.30pm – Who is Emmanuel Macron? In the space of a few years Macron has rocketed into the French political machine. Until today he has never stood in an election, let alone won one. He does not currently belong to a party, not even the PS (Parti Socialist) in whose government he serves. He is the leader of his own political movement – En Marche! This ex financier was a associate director of the Rothschild Bank of Paris. He portrays himself as neither left or right and appeals to the centre ground of French politics. In the French government he promoted pro-business anti working class policies. He is the French version of Tony Blair and has been accused of being a right wing wolf in socialist clothing. 7.05pm The count has begun. The latest exit poll polls show Macron on 23.7%, The fascist Le Pen on 22.3percent, Filon on 19.5% and the radical left winger Melenchon on 18.9 %. If true this will be the first time since the Fifth Republic was founded (1958) that neither of the centre left or centre right parties will have reached the run-off. 6.30pm Belgian media have broken the French embargo on exit polls and have said these show centrist candidate Emannuel Macron in the lead on 24% with fascist Front National leader Marine Le Pen just behind on 22%. Rightwing Les Républicains candidate François Fillon on 20.5% and left-winger Jean-Luc Mélenchon on 18%, reports said. NB these figures have NOT been confirmed by any official source.